Teacher Appreciation Week is the first full week in May. 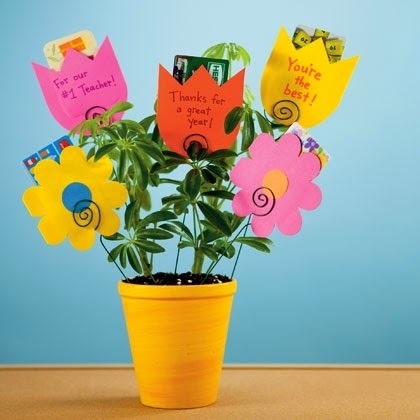 Scroll through these ideas and you will be totally prepared to thank your teachers! I think it’s always fun to give teachers a gift that they can use during the summer on their time off. We love smoothies and I thought it would be great to use a play on words with juice and a gift certificate to a juice bar. 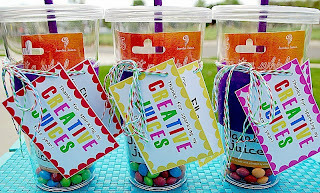 Find a darling cup, Create and Cut out cute saying tags, Punch a hole in the corner of the tags and string ribbon through, Have your child sign their name, String the tags through the ribbon and tie on the cup and Fill the cup with candy and a gift card. These are sure to make the task of calculating all of those end-of-the-year report card grades a little less mundane! For this project, you will need…A small solar calculator, Patterned paper, Pencil, Scissors, Mod Podge, Foam brush, Clear treat bags, Computer and printer, Cardstock and Ribbon. Lay the calculator on top of the paper and trace around it with the pencil. Cut within the boundary of the line you just drew by 1/8″ or so, so that the paper piece fits perfectly on the back of the calculator, as shown. Apply a thin coat of Mod Podge to the paper piece with the foam brush, and then adhere it to the back of the calculator, making sure to smooth out any bubbles. Now, apply 2-3 light coats of Mod Podge over the paper, allowing each coat to dry for 10 minutes or so before adding the next. When the last coat is applied, allow the Mod Podge to dry completely. 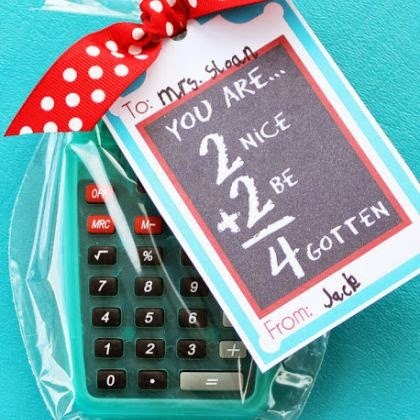 Using a computer and printer, print the equation gift tag (linked below) onto cardstock. 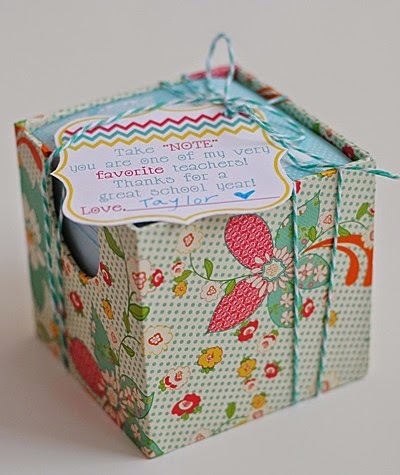 Cut the tags out with scissors, and have your child write his or her teachers’ names and their name onto the tags. Now, slip the finished calculator into the treat bag, and close the bag with a piece of ribbon threaded through the gift tag. 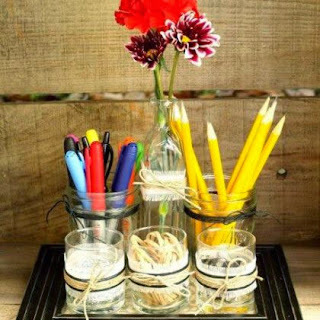 With this desk organizer there’s a place for lots of supplies – but there’s still room for sweet little vase to hold all those flowers for teacher. This is so quick to put together too – and it’s easy to customize for your teacher – or even for your desk at home! Here’s what you’ll need: Frame – this one is a 5 x 7, Fabric piece – 6 x 8, Posterboard or cardboard – 5 x 7, Adhesive or Wonder Under for fabric, Small Jars to fit in the glass space of frame (These are three small votive holders from Michael’s, 2 small canning jars and one small vase), Twine, cording and fabric for wrapping and Hot glue. Begin by cutting out your fabric and posterboard pieces for your frame. The posterboard is to stabilize the fabric so it will lay in the frame nicely.You’ll want to apply some sort of adhesive to the fabric. You can use a spray-on glue or use Wonder Under. Apply the fabric to the posterboard.Place your fabric piece into the frame behind the glass and put your frame back together. Now we have a pretty base tray for our organizer! Now begin wrapping your glass pieces. Here is used a combination of black and brown jute, and organza. For the organza, cut the pieces for the small vases and then pull the long threads off both sides to give it a frayed look. Wrap the fabric around the small glass pieces and hold it in place with a little hot glue. (Not too much or the fabric will be lumpy.) Wrap your jute or cording around the fabric and tie in a pretty bow. Place all your wrapped pieces on the frame. Add just a tiny bit of hot glue to the base of each piece to hold it in place. Now you can fill it with fun supplies to finish off the gift! How easy was that?! 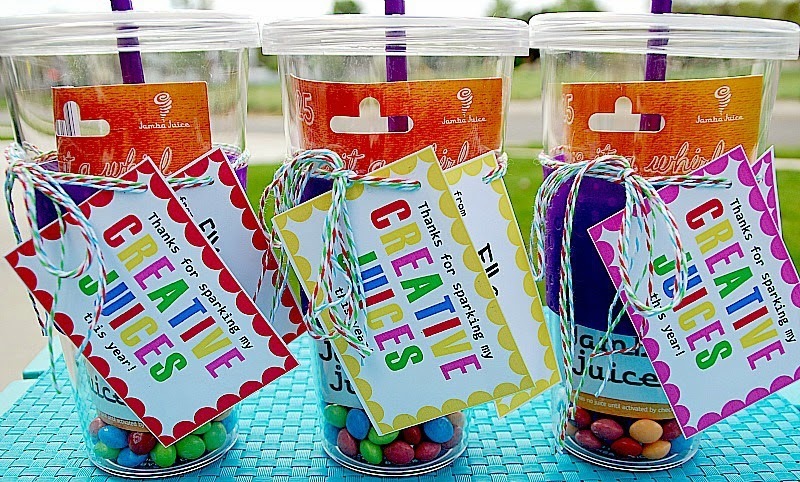 This idea for Teacher Appreciation could not be any easier to create! All you need is an oven mitt and some treats (candy, pencils, pens etc. ), some ribbon and a printable tag. 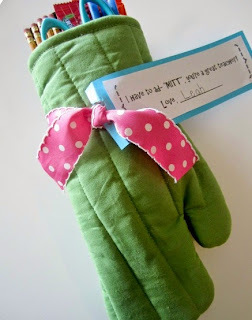 Fill your oven mitt with the treats, add a tag with some ribbon and that is it! 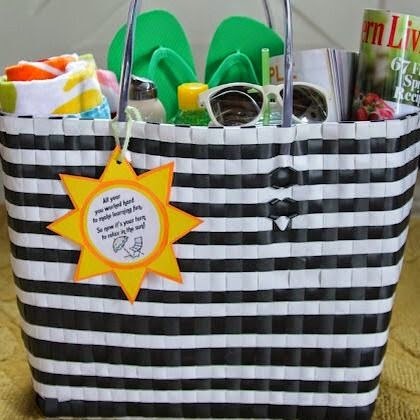 This gift is a bag filled with items that will come in handy poolside or at the beach. Start with a cute tote and fill it with all sorts of goodies. The fun part is that your child can help pick out the things for their teacher. Who says money doesn't grow on trees? Sow a giving tree by surrounding a potted plant — we used a schefflera — with a grouping of card stock envelopes shaped like flowers. In the openings, slip gift cards donated by students in the class, then ask each contributor to write a short thank-you note on theirs. 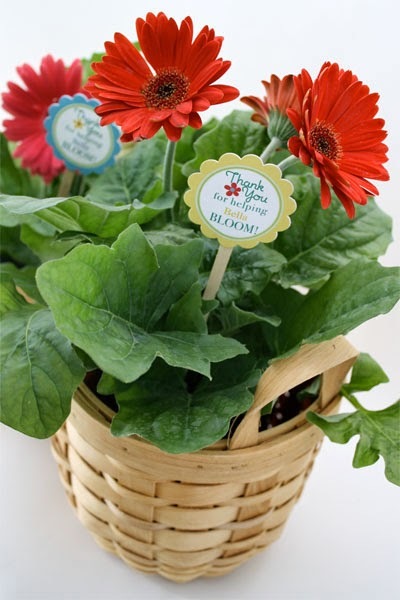 Or, for an all-natural way to say thanks for helping kids thrive, you can give a crate of flower bulbs. What you'll need FOR THE GIVING TREE: Needle-nose pliers, Floral wire (we used 18-gauge), Card stock, Envelope, Glue, Houseplant. FOR THE CRATE OF BULBS: Flower bulbs, Gardening supplies (gloves, trowel), Old fruit box. And how to make it come together? SOW A GIVING TREE: To make each stem, use the pliers to bend the end of a length of floral wire into a spiral. For the envelope, download our template. Fold the card stock, then trace and cut out a flower, as shown. Glue the edges to form a pocket. Push the stems into the soil and add a flower with a gift card to each. GIVE A CRATE (OR A BARREL!) OF BULBS: Ask each student to bring in two or three summer-blooming flower bulbs, such as dahlias or gladiolas. Pack the bulbs — along with gardening gloves, a trowel, and a gift card to a garden center — in an old fruit box or the like. A teacher can't help but remember the class when the flowers bloom. Take “NOTE” you are one of my very favorite teachers! Thanks for a great school year! Love, ________________ You could use this little tag with a notebook, sticky notes, journal, etc and it would work perfectly! Super easy! A group of friends and I share a tradition of taking our kids’ teachers lunch during teacher appreciation week. We tally up the amount of lunches we need, notify our teachers and then gather in the morning to assemble the lunches. One friend makes delicious chicken salad, another brings croissants for the sandwiches, one brings fruit, another makes wonderful pasta salad and another awesome brownies. I take care of the packaging. Last year I made these sacks. This year I made oilcloth lunch sacks. 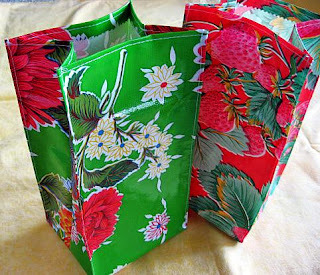 How to make an oil cloth lunch bag I first made a pattern out of cardboard measuring 15 x 12. Cut a 2 1/2 inch square out of each bottom corner. Take two pieces of oilcloth right sides together and draw around your template. Cut out. I used small clothes pins to hold the pieces together. I used pinking shears to cut across the top (very optional- I thought it gave the edge a finished look). Sew down each side and across the bottom. Fold in bottom of bag bringing bottom seam and side seam together. Pin bag bottom to bag side with clips. Sew across on each side. Turn bag right side out and fold in top of bag about 1/2″ and then top stitch. Measure about 2 1/2 inches from middle side seam on all four corners, finger press, clip with clothes pins. Top-stitch closely to the corner fold on each of the four sides. Finished! Whip these flower picks up and grab some flowers on the way to school and you are set to say thanks to a special teacher! Create a tag, Cut circles with a 2 inch scallop circle punch. Glue two back to back (pretty scrapbook paper can be used for the backs if you prefer) with a long wooded craft stick (or skewer) sandwiched in between, Stick your pick into some beautiful flowers and brighten your teacher’s day!